It is always there on the horizon when I drive to work - jutting majestically into the air. It's white year round, sometimes with a puff of clouds around the top, like a celestial halo. But, this morning I looked and Mt. Rainier had simply disappeared. Gone. Slamming on the brakes I pulled over and stared. How could our state's defining symbol of white mountains, green forests and sparkling beauty just vanish? Thirty years ago the same thing kind of happened. It was a glorious sunny Sunday. We had heard rumors that Mount Saint Helens was rumbling. Some scientists said an eruption was imminent, but many others thought it was just another false alarm because the current inhabitants of the Northwest hadn't seen anything more than a puff of steam from any of our volcanos in living memory. As I flicked on the radio in the car, the announcer said, "This is it, This is the big one. Mount Saint Helens is blowing its' top." 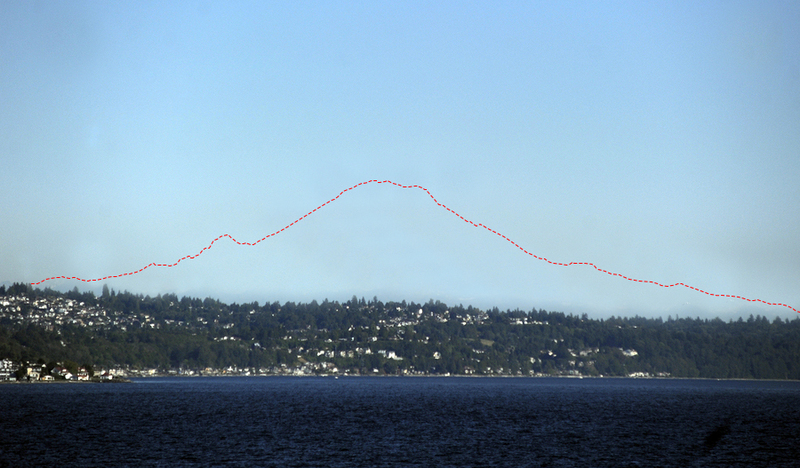 Even from 100 miles away, in downtown Seattle, a massive smoke plume was visible jutting a hundred thousand feet into the air. A quick drive to the water tower on Seattle's Capital Hill, allowed me to climb up a hundred steps to the highest point in the city, and peak out the slender windows. The view was even more impressive. It looked like a fast flow smoke stack and yet it was a monstrous mountain and, due to scale, it was far bigger than anything a factory could create. We have since forgotten the ash that covered many states and even blanketed Seattle and Portland, Oregon. We have forgotten the television coverage of massive destruction and loss of life. The heroic stories of volcanologists and local residents have faded. And now, this very morning, the same thing seemed to be happening with Mount Rainier. Except this time there was no smoke, no steam and no rumbling. As with that day Mount Saint Helens erupted, the weather was clear, the skies were blue and yet - Mount Rainier was simply gone. I flipped on the car radio, but this time there was no excited announcer with no mention at all. On the television, there was no announcements. And, in the newspaper, there was no story. On the internet, there was nothing. It seems the city, the state and the entire world had forgotten that Mount Rainier was ever there. Native Americans revered the "Mount Tahoma" as the mountain that was God. To the first white settler's, the mountain was the beacon they first saw when traveling overland to the Northwest or when having arrived by ship. Its' presence was difficult to ignore as it dominated the landscape. They knew there were arriving when they first glimpsed at the monstrous mountain and its' glistening mantle of snow and ice. So how, after all of these years, could Northwest occupants simply forget about Mount Rainier? Established as a national park in 1899, still 97% of the park remains in its natural state. For a century, traveling to the Mount Rainier area was the highlight of a summer vacation. Families came for extended stays and skiing its' slopes was a highly desirable getaway. Crowds traveled first by horse and buggy, and later by automobile to see the wonders of nature. They swamped the campgrounds, crowded the roads to Paradise on the mountain's Southwest shoulder and to Sunrise on the Northeast. In early summer, massive fields of wildflowers took away the breath of visitors of all ages and all races. Some feel the hand of God here. So, how had apathy caused Mount Rainier to disappear? Today, visitors flock to other Northwest destinations where they can run their ski boats, listen to loudly amplified music and stroll the streets of franchised stores. Professional advertising successfully entices families to visit freeway resorts complete with high priced meals, pricey gift shops and many man made waterfalls also known as water parks. Visitors have somehow been convinced to find other places to have today's version of fun where activity outweighs nature. Or have they? Although, the number of visitors to Mount Rainier has shrunk over the years, t the count is not altogether insignificant. And, the grandeur of the mountain, forest and rivers remains. Visitors who remember to find Mount Rainier are rewarded with the view of wildlife, flora, glaciers and magnificient old growth forests. In the grove of the patriarchs, massive trees stand mute and unassuming. The silence is defening and stunning. Villages and towns like Ashford, Enumclaw, Greenwater, Morton and Packwood have charming accommodations. You may not think that the city air is bad, until you arise early one morning, throw open your door and are overcome with the fresh smell of flowers and evergreen trees. 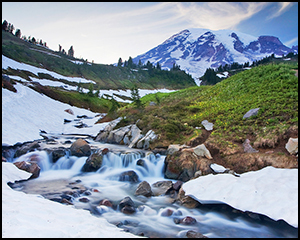 Unlike man made resorts, Mount Rainier is a bargain. Staying at a hotel, cottage, cabin or bed and breakfast can be a special experience. Dining can be rustic and astoundingly affordable. Park fees are low and you can set your own schedule to visit for a day, a weekend, week or even longer. The children in your family will giggle in laughter visiting the snowy fields, romping in the meadows and wading in the streams. Everyone will enjoy re-discovering that Mount Rainier is still there, still pristine and still beckoning with beauty, enjoyment and relaxation. You can bring Mount Rainier back to life. To rediscover Mount Rainier visit www.VisitRainier.com and finding handy lodging at www.MountRainierVacationRentals.com sponsored by the Vacation Rental Association.